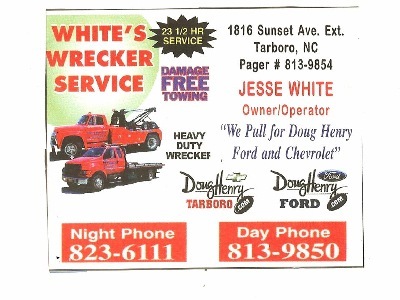 Here at White's Wrecker Service & Repair, we have been proudly serving the Tarboro area for many years. With over 40 years of experience being a heavy duty wrecker service for medium sized trucks to automobiles. In the meantime you can reach us at [252-823-6111 -OR- 252-813-9850] and by fax at [252-823-2238]. We are looking forward to hearing from you. You can also contact us at our e-mail address: [whitewrecerservice@centurylink.net].